Hulu Live TV Review - Watch Live TV & Enjoy On-Demand Video As Well! Hulu Live TV Review - Watch Live TV & Enjoy On-Demand Video As Well! Hulu Live TV Review – Is Hulu Finally Good Enough For You to Cut the Cord? Cord-cutting is the best solution for millions of people who would rather bring their TV-watching to the digital age, and Hulu is here to help out everyone. On top of the on-demand videos you can watch on Hulu (including award-winning original programming), you can also enjoy loads of TV channels. While the video-on-demand service has been around for about a decade, in May 2017 the company also launched its live television streaming service, which puts it on our cord-cutting options list. So, how usable is Hulu’s live TV platform? Is it good enough to abandon your cable operator and enter a new era of media streaming? Let’s take a closer look. If you continue reading, you’ll get to dive into Hulu’s capabilities and its current offer. Just like in every review we publish here on TechNadu, you will find plenty of on-point information that’ll help you to decide whether the service is worth your money. So, let’s take a close look. Hulu is only available in two markets – the United States, and Japan, although the US version is the most popular and the one we’re going to discuss today. While traveling the world, you could still have access to Hulu via VPNs, but you’d have to be careful because the company has a special system to figure out if you’re using one and few manage to avoid detection. The rule of thumb is to get a premium VPN like ExpressVPN and to check beforehand if they have servers that work with Hulu and other similar services. Being a quite a versatile tool, offering an all-in-one service where you get to also watch cool content whenever you want, as well as live TV when the mood strikes. So, to get started with this service, Hulu has three plans you can purchase. The first two offer strict access to TV series and movies and other types of content, while the third is the one that offers Live TV. Essentially, when it comes to cord-cutting, Hulu has a single plan. Limited Commercials – $5.99 per month – This bundle offers users the possibility to watch full seasons of exclusive series, new episodes, classic movies, and so on. There are also Hulu originals available, kids shows, and blockbusters. Given the lower price, you’re also going to get your content interrupted by commercials every once in a while. No Commercials – $11.99 per month – As the name suggests, this one offers users the possibility to watch all the content we’ve mentioned above without getting interrupted by commercials. Therefore, this is on par with the likes of Netflix. 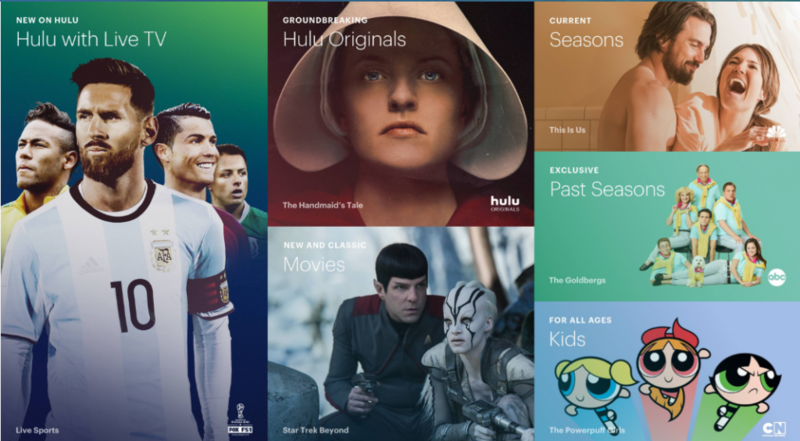 Hulu with Live TV – $39.99 per month – With this package, you can view all the content we’ve mentioned before – TV series, original content, movies, kids’ shows, documentaries, and so on. On top of that, you can also view live and on-demand TV from over 50 TV channels. 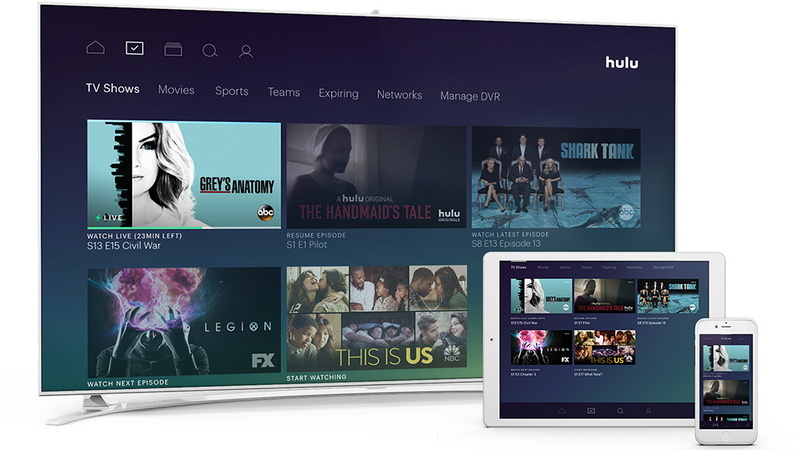 Hulu’s offering includes ABC, ABC News, CBS, CBSN, FOX, NBC, A&E, Animal Planet, Big Ten Network, Boomerang, Bravo, Cartoon Network, CBS Sports Network, Cheddar, CNBC, CNN, CNN World, Cozi TV, The CW, Disney Channel, Disney Junior, Disney XD, E!, ESPN, ESPN 2, ESPNews, ESPN U, ESPN College Extra, ESPN Bases Loaded, ESPN Goal Line, Food Network, Fox Business, Fox News, FS1, FS2, Freeform, FX, FXM, FXX, Golf Channel, HGTV, History Channel, HLN, Investigation Discovery, Lifetime, MSNBC, MotorTrend, National Geographic, Nat Geo Wild, NBC Sports Network, Olympic Channel, Oxygen, Pop, ESPN SEC Network, Smithsonian Channel, SYFY, TBS, TCM, Telemundo, TLC, TNT, Travel Channel, truTV, Universal Kids, USA, and Viceland. On top of these, you’ll also get some local channels you can watch live, depending on the area you live in. Those who want more out of their Hulu experience may have noticed that some important channels are missing. These channels fall into the “premium” pool and always require additional payments to be made. On the other hand, what Hulu is missing compared to other OTT platforms out there is the possibility to add channel bundles to expand the number well beyond the 50 or so currently offered. So here’s what you can do to customize your Hulu. HBO – $14.99 per month – Adding HBO to your Hulu plan is quite easy and the price falls in line with other similar platforms that offer HBO as an extra. On the other hand, you’ll enjoy Game of Thrones, Ballers, and other original HBO content, as well as the latest box office, hits to land. Cinemax – $9.99 per month – Just another $10 will bring you instant access to hundreds of movies we know you’ll love, as well as original series, and more. Cinemax is a great source of content and it will certainly enrich your collection. Showtime – $8.99 per month – Showtime is also present in Hulu’s list of options, allowing you to watch endless hours of great shows, movies, documentaries, and laugh until your belly hurts with the great comedies they offer. Starz – $8.99 per month – You can also add Starz channels to the mix on Hulu now. The price falls in line with what other platforms are asking for access. So add it to your subscription and enjoy all that Starz original content. Entertainment Add-on – $7.99 per month – Recently, Hulu added the possibility to add new channel packs. The Entertainment pack features CNBC World, Cooking Channel, DIY Network, FYI, Lifetime Movies, American Heroes Channel, Destination America, Discovery Family, Discovery Life, and Science. Espanol Add-on – $4.99 per month – Another recent addition is, essentially, a Spanish-language pack. The pack includes CNN en Espanol, ESPN Deportes, History en Espanol, NBC Universo, Discovery en Espanol, and Discovery Familia. Enhanced Cloud DVR – $14.99 per month – Hulu’s Live TV package already comes with some Cloud DVR space, but it’s limited to 50 hours. With this feature, you can expand that to 200 hours with fast-forwarding through commercials. You can also record as many things at once as you want. Unlimited Screens – $14.99 per month – Hulu Live allows users to stream content to two screens at the same time. This feature opens your account to as many screens as you want. This can come in handy if you’re planning on sharing your account with a family member or close friends – you may even get to split the bill. Enhanced Cloud DVR + Unlimited Screen – $20 per month – Hulu gives you the option of mixing the two features above for a better price. 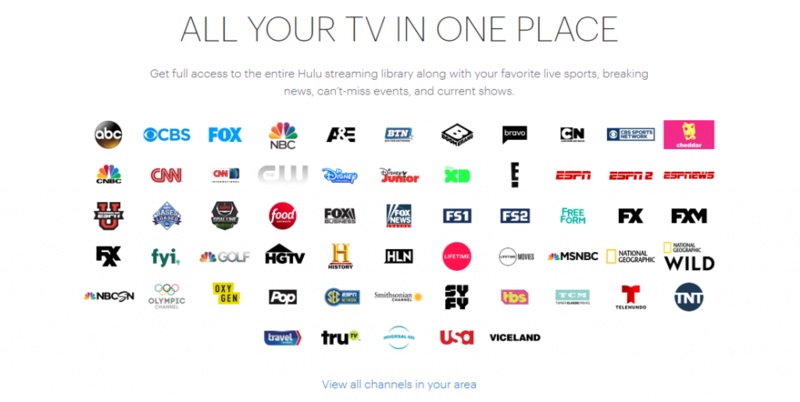 The regular Hulu package only offers users the possibility to check out the streaming library, but the package that also offers access to Live TV is much more impressive. As we mentioned above, that package comes with 50 hours of Cloud DVR. That limit can be expanded to 200 hours by buying the aforementioned feature. Since 50 hours can be reached quite easily, investing in it may be a good idea, but in the end, it depends on your watching habits. 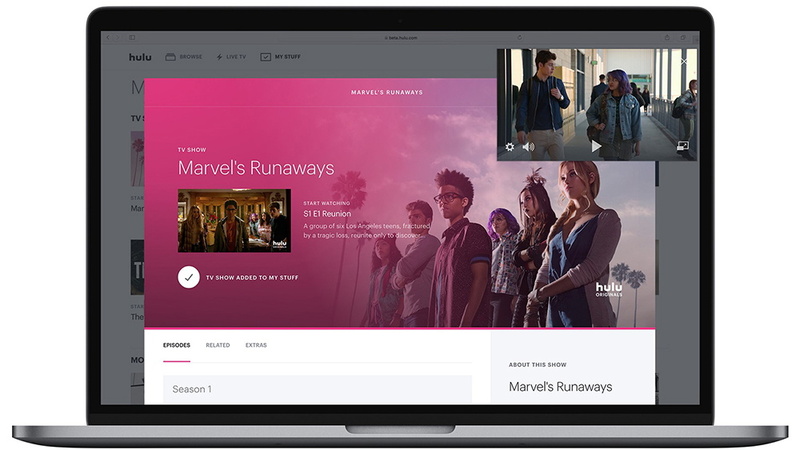 As mentioned, Hulu with Live TV also allows users to stream content to two different screens at the same time, but you can create the same six profiles that come with the regular Hulu account. According to Hulu, if you plan on watching any content on its on-demand service, you need to have at least a 3 Mbps Internet connection. But since we’re talking about cord-cutting here, you’re going to need 8 Mbps to live-stream. On the other hand, Hulu comes with 4K support. So, if you’re one of the lucky ones to have such a screen, then you’re in for a treat. Live TV, however, won’t hit that 4K quality we’d all love so much. In fact, the top number you’ll get is 720p HD, but that’s not Hulu’s fault. When you decide to cut the cord and pick a service like Hulu Live TV, you expect to be able to watch the things you want no matter where you are and on what device. Thankfully, Hulu has an extensive list of apps available. To start things off, you can watch Hulu on your PC straight from your browser. Then, you can download apps for iOS (iPhone and iPad), Android (phones and tablets), FireTV (Fire TV and Fire TV Stick), Apple TV (4th generation), Roku, Nintendo, Switch, Xbox (One and 360), Chromecast, and select Samsung TV models. The company promises that more devices are coming soon, and that would be great since PlayStation is missing from the list. Hulu’s interface is pretty straightforward. You get to pick what type of content to watch from tabs at the top of the page and then go ahead and pick what you want to stream. Whether we’re talking about the regular videos or Live TV, you’re surely going to easily figure it out. The best part, of course, is the fact that you can also check out the content by genre. Hulu, like any other service out there, has good and bad parts. While these notions are pretty subjective, we’re still going to tell you how we found it. And, let’s also not forget to mention some downsides as well. Here are three things that we didn’t like about Hulu. Low DVR limit – unless you pay an extra $15, you only get 50 hours of recordings. Hulu makes choosing quite easy as there’s only one bundle, but keep in mind you’d get access not only to live TV, but also the massive video library, so go ahead and subscribe to Hulu. Overall, Hulu is a great service. If only for the fact that Hulu is originally a video-on-demand service that has now expanded into live TV territory and it’s worth a try. Please let us know what you think in the comments section below and share the article on Facebook and Twitter so others can find it too. Live TV streaming may not be Hulu's main purpose in life, and there is a lot of room for improvement here, but since it also gives users access to the movies and shows in the library, this is a great deal.